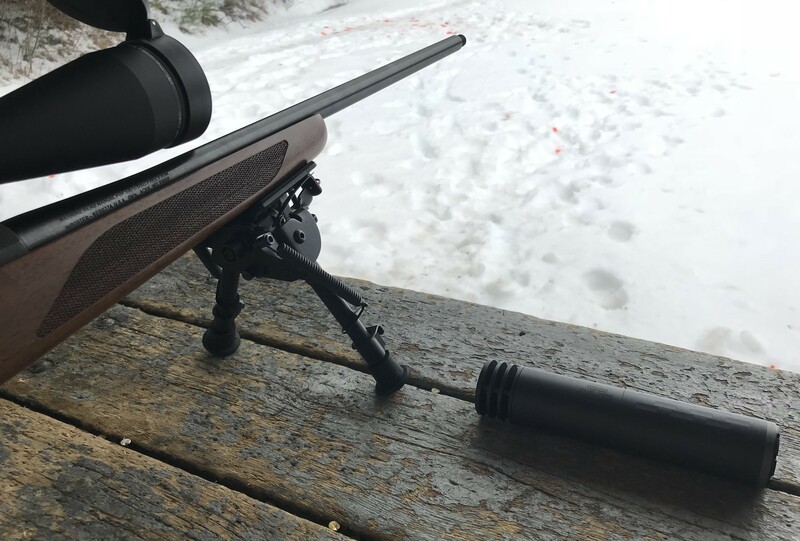 Tuesday afternoon, Rep. Paul Lefebvre (R-Newark) sat at a bench next to a bolt-action .308 hunting rifle with a suppressor screwed onto the barrel. He chambered a round, looked down the scope and fired. Lefebvre was one of three Vermont lawmakers attending an event sponsored by the American Suppressor Association at a shooting range in Barre. Hours earlier and just four miles away at the Vermont Statehouse, students and activists had rallied for new gun control legislation in the wake of last week's mass school shooting in Florida. But at the Barre Fish & Game Club, state legislators were focused on why suppressors, better known as "silencers," should be legal for hunting in Vermont. Rep. Patrick Brennan (R-Colchester) helped organize the event as a way to educate lawmakers and Department of Fish & Wildlife officials about how suppressors work and what they sound like. He was joined by Rep. Susan Buckholz (D-Hartford), who also shot the .308. Brennan didn't fire the guns himself — and said the event was more for the purpose of listening than shooting. “Basically it’s to raise awareness, expel the movie myth and, hopefully, get a bill passed that protects hunters and their hearing,” Brennan said. The movie myth he’s talking about? As the national and state discourse focuses on access to guns as a public health issue, Brennan said his efforts to expand the legal use of suppressors focuses on a different gun-related health hazard: hearing loss among shooters. At Tuesday's shooting demonstration, Brennan acknowledged the groundswell of support for legislation following the Florida shooting and a close call in Fair Haven, but he said that debate was unconnected to his own effort to expand the legal uses of suppressors. "This isn’t a firearm by itself. It’s an accessory," he said. "And it is all about hearing. It doesn’t promote gun violence in any way." Brennan said he saw no need to postpone the event in light of recent events. "Would there be a better time for this? We have an epidemic of school shootings and just people basically going off the deep end nationwide, and I think that needs to be addressed, but I don’t think the suppressor shoot would benefit that at all," he said. "The discussion will happen, needs to happen … and I think there’s a move in the Statehouse even to do something. We, everybody realizes it’s turning into an epidemic. But as far as postponing something like this [event], this has been in the works for, like, two months." The demonstration, paid for by the ASA and the Congressional Sportsmen’s Foundation, did not address the topic of gun violence. It focused almost entirely on the benefits suppressors offer hunters. “I think it’s about time we get on board and help protect some of the hearing of our outdoorsmen,” Brennan said. According to the ASA, 42 states allow civilian ownership of suppressors. Forty of those also permit their use in hunting, but not Vermont or Connecticut, where they can only be used for target shooting. Last year, Brennan introduced a bill to change that. Suppressors are regulated federally through the National Firearms Act of 1934. Anyone buying one must go through a federal background check process and purchase a $200 tax stamp from the Bureau of Alcohol, Tobacco, Firearms and Explosives, a process that takes months. At Tuesday's demonstration, ASA executive director Knox Williams kicked off the festivities by shooting each of the guns without a suppressor, then adding the attachment and firing again. Williams noted that his organization, which formed in 2011, doesn't discourage the use of other hearing protection, such as earplugs or ear coverings — but he acknowledged their limited use. Williams said studies have shown that 70 to 80 percent of hunters never wear any form of hearing protection, but gunshots are loud enough that even one or two can cause permanent damage. Brennan offered himself as an example. A suppressor cut in half. When a gun fires through a suppressor, the bullet passes through its center as the hot gases behind it expand into the cone-shaped chambers within the cylinder and slow down before leaving the gun. Vermont game wardens, however, see an advantage to the noise emitted by guns: It’s much easier to detect poaching when a poacher’s shots can be heard from miles away. “It’s our mandate and our mission to prosecute and arrest people who poach, and one of the ways that poachers are caught is when the wardens hear a shot and it’s either not legal shooting hours or not open season,” said Vermont Fish and Wildlife Commissioner Louis Porter. The commissioner attended Tuesday's event with several game wardens to get a better understanding of how suppressors used in hunting would affect their work. Porter said the department hadn’t yet weighed in on the legislation, but he noted that poachers using suppressors wouldn't be as quiet as those using other available weapons, such as crossbows. “I think it’s interesting to see, you can still very clearly hear the shots, especially from the larger calibers, which would be more likely to be used [for poaching]," Porter said. A .308 rifle with a threaded barrel alongside a suppressor. 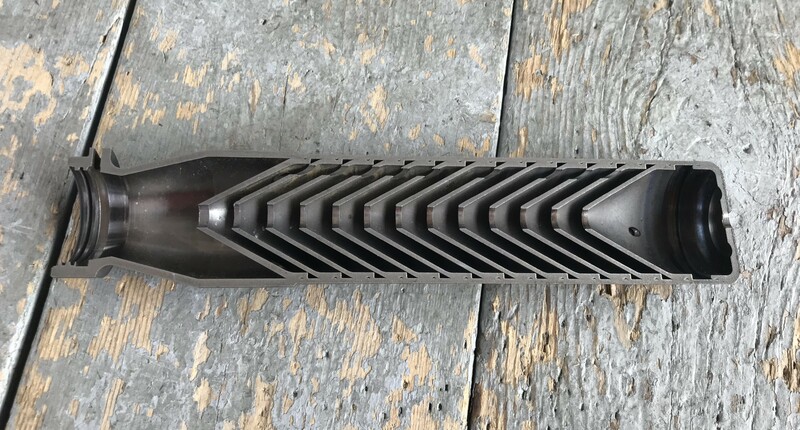 Suppressors, often cylindrical, attach to guns at the end of the barrel and capture expanding gases that propel the bullet out of the gun, then release those gases more slowly than a normal gunshot. 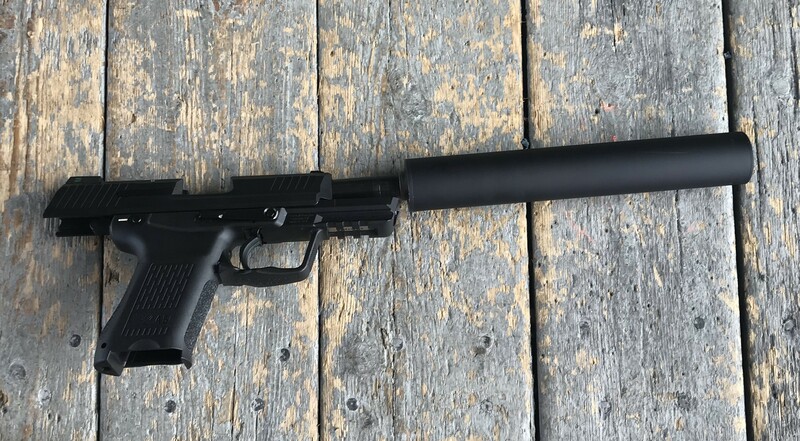 Adding a suppressor makes the sound of the shot quieter and reduces the recoil, or kick, felt by the shooter. Tuesday’s demonstration included a semi-automatic .22 long rifle, a .45 caliber pistol, a 12-gauge shotgun and the bolt-action .308 that Lefebvre shot. Williams fired each gun three times without a suppressor, then three times with a suppressor attached. The devices made the guns notably quieter and removed the concussive force that bystanders could feel standing near the unsuppressed .308 rifle as it fired. But the shots were by no means silenced — and could be heard from inside a closed car about 100 yards away. In an interview, Williams agreed with Brennan that a major goal of events such as Tuesday’s is to dispel Hollywood myths about suppressors. He said concerns about their use in violent crimes or to conduct a mass shooting without bystanders noticing are unfounded. Rep. Brennan and Rep. Lefebvre were already on board with the proposal, and their minds weren’t changed Tuesday.